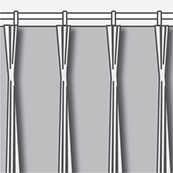 Heading is the way the top of the curtain attaches to the poles or track. There are different headings you can choose for your curtains and all depend on your preference or the type of pole or track you are using. The type of heading you choose can sometimes effect the curtain’s look (to achieve a contemporary or a traditional style) and cost (some headings require more fabric and complicate processes than others). A pencil pleat heading creates a simple and tidy feel. It can be hung onto both curtain track and pole system. This curtain style is perfect for a room with large glass windows or doors. 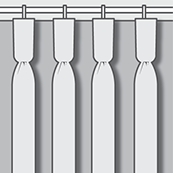 To keep the tidy headings, you may draw the curtain open by the tiebacks (not to move headings to the left and right ends). If you prefer the neat slim folds, please don’t choose very heavier weight fabrics. A very formal and elegant heading. It is very similar to Triple/Pinch Pleat, but requires less fabric. 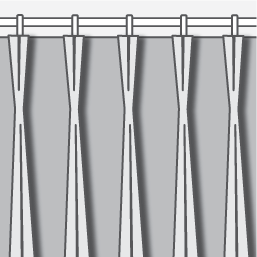 Triple/Pinch pleat curtain creates a quite formal dressing. 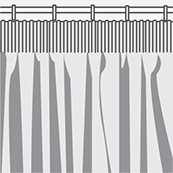 Triple/Pinch pleat headings which are more gathered than other curtain styles. It can be paired with modern furnishings and furniture to create a contemporar look. Eyelet curtain creates a contemporary look with large, even and naturally soft folds. It suitable for both lighter and heavier weight fabrics. Eyelet heading doesn’t require as much fabric and is great for showing off prints. Tap Top curtain gives a modern, informal and romantic feel. 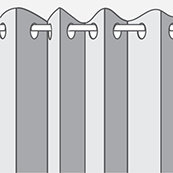 Tab top curtain has loops at the top which can only be hung with pole system. It is suitable a sheer, billowy fabric or voile. 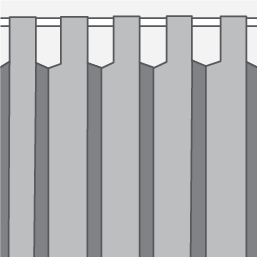 Goblet pleat curtain is the most formal type of curtains. It is suitable for a formal room with high ceiling and works well with heavier fabrics. It is not suitable for a small window.